Tag Archive | "Redtail Shark"
The Redtail Black Shark (Epalzeorhynchos bicolor), also known by tropical fish keeping enthusiasts as the Redtail Shark or Redtail Sharkminnow, is native to the lakes and rivers of Western Thailand, and although once common in Bueng Boraphet and the Chao Phraya River as far south as Bangkok, until recently was believed to be extinct. As of 2011 the Redtail Black Shark was only known at a single location in the Chao Phraya basin and is listed as Critically Endangered on the IUCN Red List. 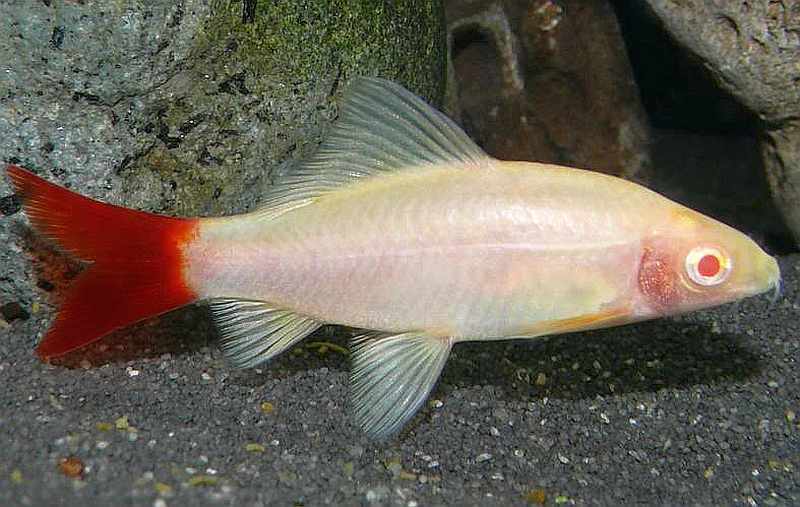 Although it is critically endangered in the wild, captive bred specimens are common in aquaria, where they are prized by tropical fish keeping enthusiasts for its deep black body, vivid red or orange tail, and white tipped dorsal fin. The Redtail Black Shark is a semi aggressive Cyprinidae and provided only one specimen is housed in the tank, is an ideal candidate for a semi aggessive community aquarium with like sized tankmates. Although they get along with other semi aggressive speciees, they do not like other sharks. When two Redtail Black Sharks are housed together, one shark becomes dominant and will constantly chase and harass the submissive shark, preventing it from feeding or resting. This usually results in the death of the submissive shark however, when kept in larger groups of five or more fish a hierarchy results and the fish get along much better. Although Epalzeorhynchos bicolor will rarely bite other fish, they are aggressive chasers and will target larger, docile fish like Silver Dollars. Usually they will only chase other fish away from their territory and then retreat. 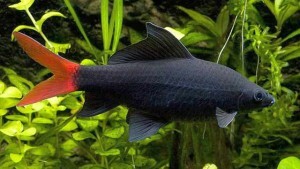 Redtail Black Sharks are bottom dwellers that like plenty of hiding places in their tank. They thrive in a tank that mimics a flowing river with a substrate of various sized rocks over a gravel substrate, some larger water worn “boulders”, some driftwood roots and some aquatic Microsorum , Anubias , or Bolbitis attached to the rocks and driftwood . Bright lighting to promote the growth of algae and associated microorganisms, a good filtration system and a power head to create moderate water movement will keep the fish healthy and free from disease. , daphnia , small Artemia and good quality flake or granule foods along with fresh plant materials. An occasional treat of cucumber, spinach, shelled peas, or finely chopped fruit will keep the fish healthy and in good color. All Redtail Black Shark purchased in tropical fish shops are now farm bred and available for purchase when they reach 1-1/2″ to 1-3/4″ in size. Redtail Black Shark (Epalzeorhynchos bicolor).